1. Select an appropriate electrical component from the lower portion, click and drag it to a vacant site in the circuit. 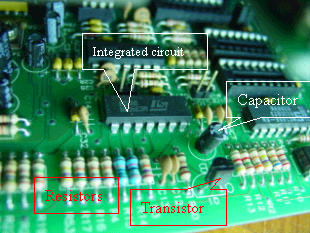 The component will be inserted into the circuit when you release your mouse. 2. To remove an inserted component in the circuit, just drag it out and release your mouse. 3. When the rheostat is clicked, a scrollbar will appear. The value of its resistance can be varied over the range 0 - 100 Ohms. 4. Click the switch to close or open it. 5. Ideal ammeters and voltemters have zero and infinite internal resistance respectively. However, if we lift this assumption (uncheck the check box near the bottom), their internal resistances then become 20 Ohms and 10 kOhms respectively. 6. Press the button "Change R" to reassign a value between 10 Ohm and 10 kOhm to R randomly. 7. Click the yellow label " Value of R" to display the value of R. Click the label again to hide the value.